Film Collectors Registry Vol.1. #2. Newspaper fanzines issued by Ted Riggs in the years 1969 to 1977 (?). 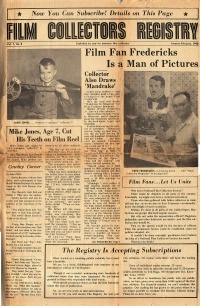 "Film Fan Fredericks Is a Man of Pictures", "Collector Also Draws Mandrake"
"Film Fans... Let Us Unite"
This page was last edited on 20 February 2016, at 10:11.